MAKING HISTORY -- PETE BUTTIGIEG OFFICIALLY KICKS OFF CAMPAIGN FOR PRESIDENT, FIRST OUT GAY CANDIDATE TO SEEK DEMOCRATIC NOMINATION FOR PRESIDENT: Read Maureen Groppe’s (@mgroppe) piece in USA Today about what Buttigieg’s candidacy means to LGBTQ people including Matthew Miller, 25. He drove with his dad from upstate New York for the campaign announcement Sunday in South Bend, Indiana, where Buttigieg is mayor. “It’s a once-in-a-lifetime thing that you just have to be there for to experience,” Miller said. Read more at USA Today and Out. In 2018, exit polling showed that more than 7 million LGBTQ voters -- 6% of total turnout -- cast ballots, making the difference in key races from coast to coast. More from NBC. And on Saturday, U.S. Sen. Cory Booker (D-NJ) officially launched his presidential campaign in his hometown of Newark, in a speech that focused on “Democratic ideals of health care for all, LGBTQ rights, economic equality and a pathway to citizenship for immigrants,” reported NBC’s Leigh Ann Caldwell (@LACaldwellDC). Read more at NBC. HRC’S CHARLOTTE CLYMER, AN ARMY VET, WRITES OPED ON UNCONSTITUTIONAL TRANSGENDER MILITARY BAN: “For over three years, I carried caskets in Arlington National Cemetery. I folded American flags for loved ones. I didn’t know anything about the gender identity or sexuality of those I carried -- just that they had died in selfless service, and they wore the flag of this country to the grave,” wrote Clymer (@cmclymer). More from Broadly. Clymer also appeared on MSNBC’s Velshi & Ruhle on Friday to discuss the ban. Watch here. My piece for @Broadly on why Trump’s trans troop ban is absolutely a ban, despite what Trump says. HRC & SAGE ANNOUNCE FIRST-EVER ASSESSMENT OF CARE FACILITIES SERVING OLDER LGBTQ PEOPLE: A centerpiece of the effort will be the Long-Term Care Equality Index (LEI), the first-ever nationwide assessment of how long-term care facilities are treating their LGBTQ residents. Facilities are being asked to take the first step by signing onto a “Commitment to Caring” pledge. More from HRC and McKnight’s Senior Living. 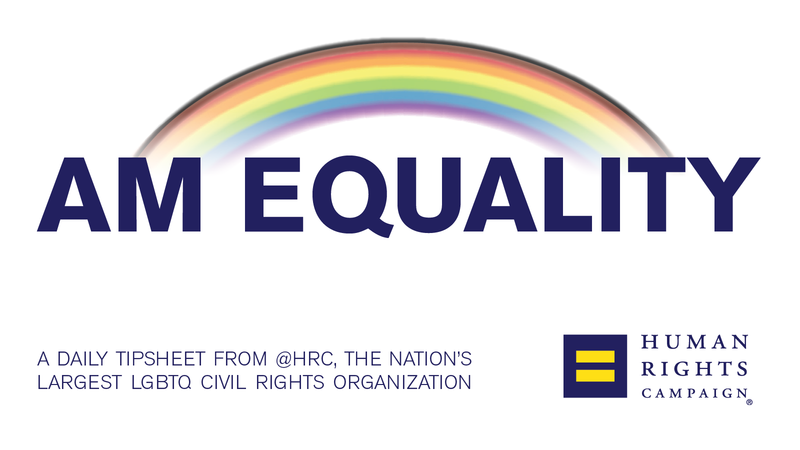 MONDAY MUST WATCH -- IN NEW HRC VIDEO, REP. STEPHANIE MURPHY (D-FL) CALLS ON CONGRESS TO PASS THE EQUALITY ACT: Watch here. "I believe in fighting to ensure that everybody has an equal shot at the American dream." THIS WEEK IN HUH? MIKE HUCKABEE CLAIMS THAT LGBTQ EQUALITY IS THE “GREATEST THREAT” AMERICA FACES: Lisbeth Meléndez Rivera (@LisbethMR_HRC), HRC director of faith outreach & training responded “The future of the Christian Church in the U.S. depends on the voices of the faithful who will continue to be vocal in supporting marginalized communities, and on LGBTQ people who are working to strengthen and transform our faith communities -- even in the face of these dangerous, exclusionary voices.” More from HuffPost. MOREHOUSE COLLEGE TO BEGIN ADMITTING TRANSGENDER MEN: More from Associated Press. “MOB VIOLENCE” -- DALLAS POLICE ARREST ONE SUSPECT IN VICIOUS DAYTIME ATTACK ON TRANSGENDER WOMAN: Edward Thomas, 29, is one of several suspects in the videotaped attack on Muhlaysia Booker, 23, who is home from the hospital and recovering. More from Dallas News, WFFA and The Washington Post. CALIFORNIA MAN CHARGED WITH HATE CRIME FOR MAKING THREATS AGAINST GAY STARBUCKS EMPLOYEE: Vincent O’Sullivan used slurs against the man, and threatened to blow up the coffeeshop. More from San Francisco Gate. INDEFENSIBLE -- BRUNEI GOVERNMENT OFFICIAL TRIES TO DEFEND DRACONIAN ANTI-LGBTQ LAW TO U.N.: More from Reuters. Australian Prime Minister Scott Morrison has reached out to the Bruneian government to express his concern over the law. More from Gay Star News. INTENTIONAL “OUTING” OF LGBTQ PEOPLE IN JAPAN CAUSING PUBLIC HEALTH CONCERNS: Local support hotlines report a spike in calls, highlighting the mental health implications of being “outed.” More from Kyodo News.